ne of the tragic and most interesting things to come out of the Great War and the Second World War was the issue of broken families, servicemen from one side who married and/or had children with womenfolk of the other side. One such man to fall for the Frauliens charms was Tom Reilly, from North Longford (Irish Longfort Thuaidh), a grand-uncle of mine. This is the only photograph we have of my grand-uncle Tom Reilly. Ive written a few poems based on what we know of his life, and times. Tom had the distinction of fighting in two world wars, in the uniforms of two separate armies. 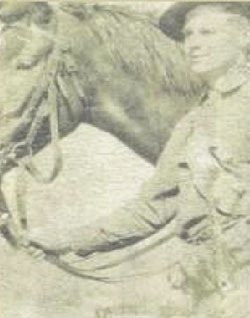 What regiments he was in we don’t know, and only have one picture of him in combat uniform while in the US cavalry from 1917. Tom came from a large family, born in Ireland while it was still part of the United Kingdom. He emigrated to America, travelling over and back every few years, unlike many of his countrymen. What he worked at we don’t know, though we do know he hit skid row on a few occasions. He joined the US Army and came to Europe in 1917, and was unscathed bar one day when he felt his leg wet, taking his foot out of his boot only to find it full of blood, having suffered shrapnel wound. Probably due to the shock, he never felt the pain at the time. After the war, he met and settled with a German girl, whose parents were shopkeepers somewhere near the Rhineland/Saarland area, we think. She had twins and tragically died in childbirth. He gave them to her parents to rear, and promptly went to America once more. He was in Ireland circa 1934/5 where he stood as godfather to my mother. Whether he went straight to England then we don’t know. Suffice to say he enlisted in the British Army for WWII, losing his arms and legs in Dunkirk. He died in military hospital in 1953, and that’s the last we heard of him. Trying to trace his grave and sons has proved fruitless, bar one possible incident. My father was in our local, Haughs of Banagher, when Michael approached him asking, laughing, had he ever heard of two Germans called Reilly. Dad laughed and said he had not. Only when talking to my mother was the possible connection with Tom Reilly considered. An operation to track the Germans that night was thwarted by running into bad company (good friends!!!) with whom he enjoyed the night. We know Tom Reilly had twins, called Tom and Ned, or German variants thereof. The child called Ned was named after a brother — possibly a twin — of Tom. Efforts to track his through the Royal British Legion proved fruitless, alas. However, a posting on the Lowlands Listserve has brought my attention to a website where you type in a name, and the site shows you the states with the highest numbers … and there are seven listings of Reilly in the Saarland-Rhineland area!!! So, now I must check these out. A cousin of ours Roisin Drake Gilligan, has found a woman – a freind of hers in Granard, who can ring some of these people, being native German she is fluent, and is waiting on me to get off my posterior and get to Granard to get in contact with them. That is on the agenda for this year!